During a recent business trip to São Paulo, when I asked a client about the deterioration of market sentiment in Brazil, he pulled his iPhone out of his pocket, opened his Facebook page and told me “just read through the first 20 posts that I have on my wall”. Apart from a couple of posts that captured a heated debate over whether a dress was white and gold or blue and black, the page was dominated by commentary about the current state of Brazilian affairs that were so negative as to leave even the most Pollyannaish Brazilian feeling pessimistic about the country’s ability to overcome its most urgent short-term challenges. While the avalanche of bad news coming out of Brazil these days is weighing on consumer and business confidence, as well as on the value of the currency, it is important that multinationals cut through the noise and differentiate between short-term risks and long-term risks. Included among the short-term risks Brazil faces are the Petrobras corruption scandal as well as water and energy rationing; risks that, while frightening, are mostly transitory. Structural risks, on the other hand, center around the failure of Brazil to correct macroeconomic imbalances, of which the most important is the unsustainability of country’s growing government debt, which if left unaddressed, could leave Brazil in recession for several more years. This is not the say that the short-term risks are irrelevant. At FSG we’re forecasting that the economy will contract by 1.5% in 2015 mainly as a result of Petrobras corruption scandal, which alone could lead gross capital formation to fall by 6.9% this year as the state-oil company and its partners are shut out from capital markets, constraining investment in energy and infrastructure projects. If Brazil were to see water and energy rationing on par with what it saw during its last energy crisis in 2001, in addition to falling investment, the Brazilian economy could contract by more than 2% this year. That said, once Petrobras and its contractors clean up their books, investment should pick up again, likely during 2016. Meanwhile, Brazil has the means to gradually modify its energy mix to reduce its dependency on hydropower while the country remains in a drought, and it is highly unlikely that the rain will remain scarce forever. However, when it comes to structural challenges there are more reasons to be worried. Last year, Brazil’s long-term credit rating was downgraded by Standard and Poor’s to BBB minus, the agency’s lowest investment-grade rating. In order to avoid another downgrade the government has committed to a primary fiscal target of 1.2% of GDP this year, which it plans to meet through a combination of tax increases and spending cuts. However, the government’s estimates of tax revenues now appear overly optimistic as they were based on the assumption that GDP would grow by 1% in 2015. To make matters even worse, President Rousseff’s PT is encountering strong opposition amongst even its own ranks in its attempts to pass important spending cuts in Congress. One of the biggest blows to Rousseff’s fiscal package took place on March 3rd, when Senate President Renan Calheiros, from the PT’s coalition-partner PMDB, rejected an increase in payroll taxes that had been already approved by the Chamber of Deputies and that would have raised government revenues by 5.3 billion reais in 2015 and 12.8 billion reais in 2016. Congressional gridlock seems increasingly inevitable as key stakeholders seem to all have hidden and conflicting agendas. The PT wants to implement austerity measures as quickly as possible so there is enough time for the economy to recover before the 2018 presidential elections. The PMDB seems to be more interested in punishing President Rousseff for her unwillingness to engage in horse-trading for ministerial positions during last October’s elections. Meanwhile, the PSDB, though unlikely to officially endorse the pro-impeachment movement against Rousseff, will not do anything that might ameliorate the rising social discontent caused by a slew of corruption scandals, tax increases, stubborn inflation, and a weakening economy. For the PSDB, the ideal scenario would be one in which the economy is only barely on the path to recovery by 2018, while the blame for an unpopular, and painful economic adjustment falls squarely on the PT. Indeed, Rousseff’s weak mandate, and sinking popularity – her approval rating has decreased by 20% since the beginning of the year – is contributing to a toxic atmosphere in which everybody seems to already be campaigning for the 2018 presidential elections. Unfortunately for multinationals and ordinary Brazilians, this political game could prove to be quite risky if it results in Brazil not being able to meet its fiscal adjustment commitments with international investors and the country ends up losing its investment-grade status. 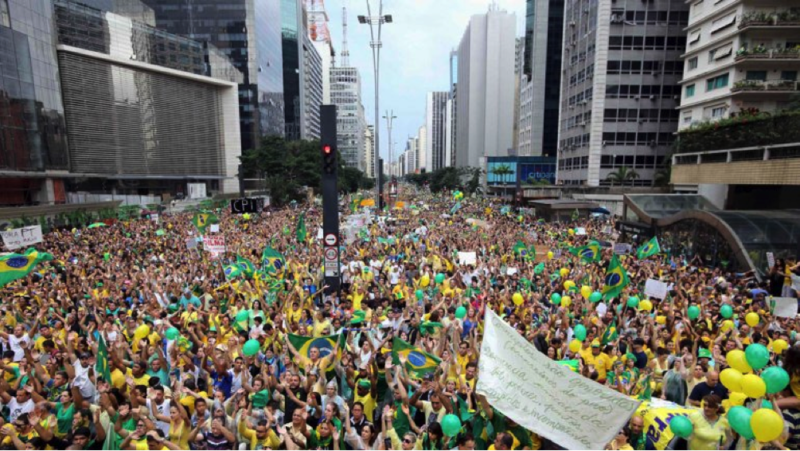 Last weekend millions of discontent Brazilians marched against President Rousseff to demand her impeachment. Politicians will be tempted to use rising discontent to keep weakening Rousseff’s and PT’s position in Congress and continue blocking much needed fiscal adjustment measures. But if they do so, they would be playing with fire, and credit rating agencies don’t like games. Pablo Gonzalez is Senior Analyst, Brazil at Frontier Strategy Group. His work focuses on helping multinational companies understand key political, economic, and business trends in Brazil, and to assist them on strategic decisions including market entry and expansion, channel strategy, M&A and local manufacturing. This entry was posted in Brazil and tagged Brazil, credit rating, Economics, politics, protest, PT, Rousseff. Bookmark the permalink.